Are you on this page in search of the best fish finder GPS combos under 500? Yes, you are. The only challenge you have here is to choose which one suits you best, since the market is teeming with great models to choose from, many of which boast fabulous features such as cutting-edge navigational capabilities, user-friendly operating systems, customizable maps, to name a few. 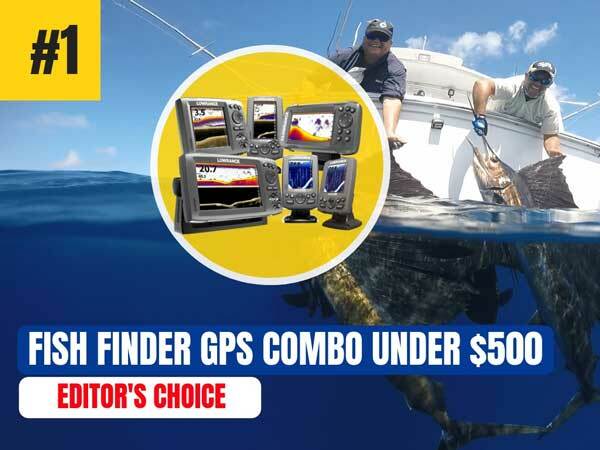 With the budget-conscious angler in mind, we have searched the catalogs of the world’s leading marine device brands and trimmed down a selection of what we believe are some of the best fish finder GPS combos under 500. Check out our short guide and review and get ready to take your fishing game to the next level. Who makes the best fish finder GPS combo? 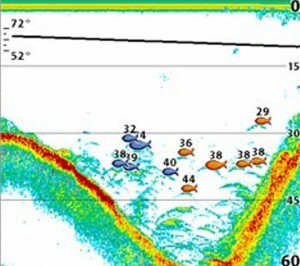 Which are the easiest-to-use fish finder GPS combos? The market is replete with a vast variety of fish finder GPS combos, which could represent a daunting prospect for any angler looking to get one that best suits his needs. Like any discerning user, you need to make sure you’re getting one that comes with a good balance of superb quality and affordability. We know very well that a roundup of good products alone won’t be enough for you to come up with a sound decision, so here’s a short guide to help you out. Humminbird, Garmin, and Lowrance are the leading manufacturers in the fish finder GPS combo category - having produced very powerfully and possibly the best fish finder GPS combos under $500. Humminbird always leaves even the most astute veteran anglers struck by how it constantly innovates on its line of fish finders. 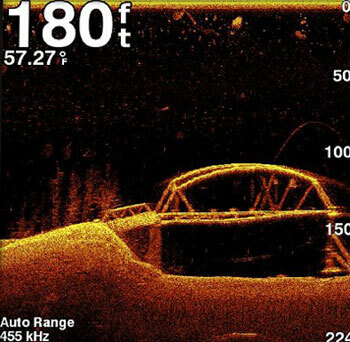 Its Helix 5 CHIRP 2 has garnered a lot of positive reviews, always ahead of the curve with its powerful combination of down imaging, Switch Fire, and side-imaging sonar. Since its foray into the industry more than half a century ago, Lowrance has made countless innovations in marine electronics, one of which is the 7X Hook-2 GPS Tripleshot. Designed with exceptional features such as its automated sonar settings, it boasts an outstanding combination of affordability, quality, and ease of use. Garmin is one of the most respected names in the fishing electronics industry and its lineup of fish finder combos is among the most sought after by enthusiasts and professionals alike. Its echoMAP Chirp 54cv is engineered with ClearVü scanning sonar technology and the Quickdraw Contours software feature, which lets the user create his own maps on any body of water. Lowrance is renowned for its user-friendly line of fish finder GPS combos. Its HOOK2-5 Splitshot, which is a sophisticated version of its Hook-5 precursor, comes with an easiest-to-use interface and a highly-optimized keypad, allowing you to make adjustments in fewer key presses. Its dedicated keypad gives you one-touch access to its essential features. It also comes with an easy front-dash bracket, letting you mount the device in minutes. Its auto-tuning sonar automatically adjusts your view as your vessel moves. Its close relative, the Lowrance Hook2-7 Series Sonar, also boasts streamlined features and highly intuitive controls, which are usually found in high-end fish finders. Its user-friendly interface makes both using the device and fishing itself very easy. 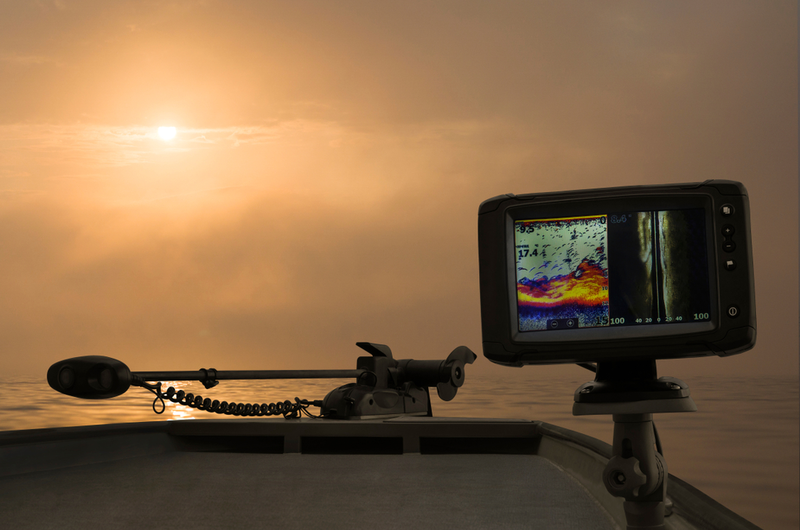 Whether you love to hunt saltwater trophies or just find it relaxing to fish on the lake on weekends, a fish finder GPS combo is a definite must-have. It inarguably increases your success rate and makes your trip as enjoyable as possible. Here’s our review of the best fish finder GPS combos under $500 to help your search a lot easier. One of the best fish finder chartplotter combos you can find, the echoMAP CHIRP 54cv beckons you to start integrating the power of CHIRP sonar into your fishing game. 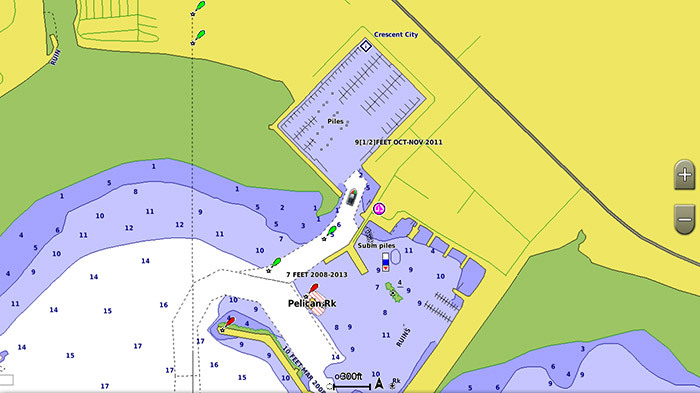 Featuring easy-to-use, easy-to-install 5-inch chartplotter and a CHIRP ClearVü for crystal-clear scanning images, the 54cv also comes with the innovative Quickdraw Contours software, which lets you create your own HD maps instantly. It has an internal 5-Hz GPS that updates position and heading at lightning speed (five times per second). The echoMAP CHIRP 54cv is equipped with a 5-inch square, 480x480-pixel, WQVGA-color display. It is designed with two-panel views, which enable you to view your 2D and CV, and charts and ClearVü in split screen. The echoMAP CHIRP 54cv is IPX7-waterproof, which means the device can basically weather splashes, rain, and even immersions up to 3.2 feet in freshwater. Its cables are secured neatly into the unit and plugged into the simple, tilt-swivel mount through a multiple pin connector. Given its connection system, you can easily unplug the unit from the mount, when necessary. With its built-in sonar capabilities, including the most innovative sonar technology, we find the echoMAP CHIRP 54cv a perfect device for boating and fishing enthusiasts alike. Unlike traditional sonar, its CHIRP sonar offers sharply-defined target separation by channeling more energy onto the fish target. The echoMAP 54cv is also sonar-recording capable, which means that it synchronizes the timing of the sonar return according to your boat’s position and saves digital information using its HomePort™ planning software, allowing you to share routes and waypoints among multiple devices. The echoMAP CHIRP 54cv features a ClearVü scanning sonar, which gives you a virtually photographic capture of what passes below your vessel. The device shows both the ClearVü scanning sonar and the traditional Garmin HD-ID™ sonar being combined into one transducer. One of the best fish finder GPS combos under $500, the echoMAP CHIRP 54cv has a fast, highly-responsive 5 Hz GPS, which updates your heading and position five times per second, making your movement on the screen seamless. It makes dropping up to 5,000 accurate waypoints and finding your way back to your favorite fishing spot very quick and easy. It is equipped with a state-of-the-art GPX software formatting, letting you transfer your stored tracks, waypoints, and frequently-traversed routes onto another manufacturer’s or Garmin fish finder device. Whether you want to keep the data to yourself or share it with other Garmin users, the echoMAP CHIRP 54cv’s Quickdraw Contour feature allows you to personalize your HD fishing maps up with one-foot contours and tailor-fit them to your needs. Doesn’t come with a unit-specific manual. The user has to painstakingly pick out the information that’s relevant to the unit. Sporting an excellent fusion of fluid performance and generous features, the Humminbird Helix 5 CHIRP GPS G2 is one of the best fish finder GPS combos under $500. Its additions of cutting-edge features, such as the CHIRP Sonar technology, Unimap charts, GPS, and transducer, make the HELIX 5 CHIRP GPS G2 among the high-value products professional and recreational anglers can find. Its versatility makes it one of the best fish finder combos for small boats and big boats alike, and for fresh and saltwater use as well. The Helix 5 CHIRP GPS G2 sports a robust design. Its microSD card slot is tucked behind its removable, waterproof cover to store your marked locations. On its back, you will see three friction-fit connection ports: the first one lets you connect to a 12-volt battery source, the second you can connect to your interface cable for linking the GPS output to optional accessories, and the third port you can connect to your transducer. We subjected the G2 fish finder into a series of fishing performance tests, and we were astounded with the results. 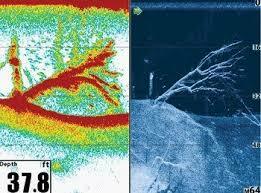 We were able to clearly view even intertwined tree branches and underwater structures using its Side Imaging display. When we switched to Down Imaging, we were able to vividly see the depth of each underwater contour and structure. With such information right on our fingertips, we were able to determine the perfect spot to track and find fish. We proceeded with the next step, which was to turn on the SwitchFire sonar, and gave us two options: max mode and clear mode. Humminbird Helix 5 G2 has also gone beyond our expectations as far as its CHIRP sonar and transducer technology are concerned. 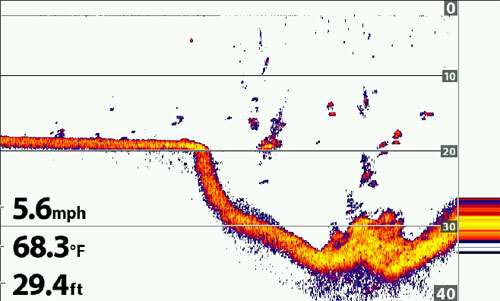 Unlike other fish finder devices that only use the single frequency, the Helix 5 G2 kicked it up a notch with its powerful combination of 2D sonar and CHIRP imaging that does not only cover a wide range of frequencies but also gives you better clarity and the excellent distinction between water structures and the fish target themselves. While the device comes with a relatively bigger transducer, its 15-millimeter magnetic mount handles it and puts the large transducer perfectly in place. The great thing about the transducer is it shows you the temperature of the water and goes down up to 1,500 feet of water depth. Like the rest of the high-end fish finders, the Helix 5 CHIRP GPS G2 is built with GPS technology that allows you to navigate your way around the lake and mark your favorite fishing spot. It has preloaded UniMap charts that display different islands, coastlines, and streams with boundaries, lakes, and rivers. Albeit the charts aren’t detailed enough to provide you with pertinent information, they are very useful especially when you don’t have any advanced navigational tool in handy. Should you decide to install this device with a LakeMaster or Navionics Chart Chip, you can use the AutoChart Live, which uses both GPS info and 2d sonar to determine the depth contour of the river or lake. 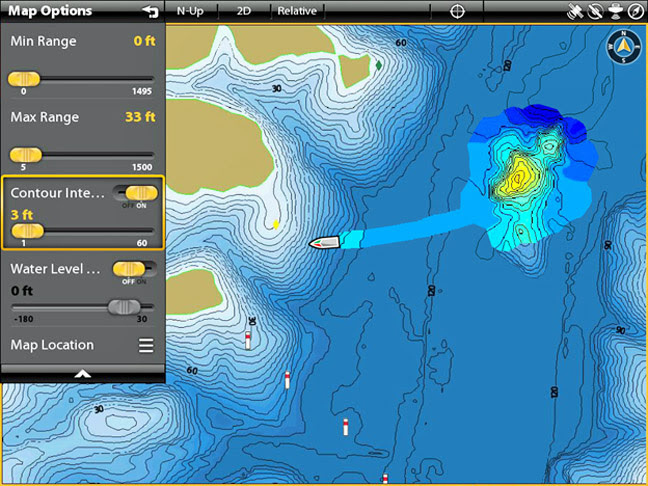 The Navionics chip lets you record up to seven hours of data in one go. While there has been a handful of models in the PiranhaMax series that has already been discontinued, the series is far from dead. Case in point: PiranhaMax 197c. It is one of the several improved models in the series, boasting sheer affordability and basic features that make it a great tool for budding anglers who don’t want to spend extra on features that may not be very useful at all. Sure, it isn’t the most feature-filled nor the strongest unit in Humminbird’s lineup by a long shot, but if you’re looking for a decent device without having to dig deep into your pocket, then you might want to take a closer look at this. It’s only ideal for shallow-water fishing but it gets the job done well even for depths up to 600 feet. The PiranhaMax 197C has a 3.5-inch color TFT, 280 x 320-resolution display with LED backlight. Its small screen delivers so-so quality images; nevertheless, its compact dimensions make it one of the best fish finder GPS combos for the kayak. Everyone knows how scarce the space on a kayak is, especially when there is other important equipment on board. Despite its size, the unit makes up with its LED backlight display made especially for bright-daylight conditions that highly compromise visibility. The transducer on the device is built with sensor that allows you to gauge and monitor water temperatures, which are important as different species of fish have varying preferences when it comes to water temperature. For instance, species like the largemouth bass thrives in waters whose temperature ranges between 68° and 78°F. In contrast, the lake trout lives in waters whose temperature ranges 48° to 52°F. Given this significant difference, a temperature sensor makes any fisher’s job a lot easier. The Humminbird PiranhaMax 197c has three alarm functions. Its fish alarm prompts you when the fish finder comes across fish targets that correspond to a certain size. It's battery alarm dings when the battery is running low. Its depth alarm alerts you when the depth is lower than or equal to your selected value. The device consists of some innovative features like the Fish ID+, which shows useful fish representations through small icons, alerting you when they are around. While it is intended to make your job a lot easier, the Fish ID+ can also be misleading at some point. It tends to mistake some underwater structures or debris as fish. A revamped version of the HOOK series, which wasn’t all that visually appealing, the HOOK2 GPS TripleShot is a 3-in-1 fish finder, hence its name. It uses three types of sonar: DownScan, SideScan, and CHIRP. It offers basically similar sonar features as its closest relative, the HOOK2-7 TripleShot, filling all voids that earlier Hook series had with more capabilities. Albeit designed for the entry- to mid-level angler, anyone who’s into fishing will find great value with the HOOK2 GPS TripleShot fish finder. The HOOK2 TripleShot comes with a 5-inch SolarMAX™ Display, giving you crisp views of underwater structures and fish targets and excellent daylight visibility. It is built with a user-friendly menu layout and highly optimized keypad that let you access the controls with a few key presses. It boasts intuitive controls and streamlined features that are normally found on high-end fish finder combo devices. It comes with both the quick-release bracket and simple flush-mount installation options for you to choose from. 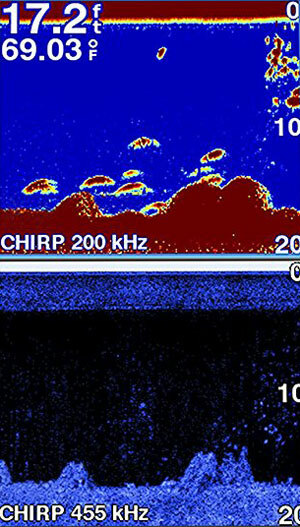 Unlike the Elite Ti models and some Simrad units that are built with TotalScan transducers, the TripleShot only operates at 200 kHz for the unit’s 2D CHIRP sonar. Thus, with its transducer, the system has to use Wide-Angle High CHIRP sonar and 455/800 kHz for DownScan/SideScan like the TotalScan skimmer. Its transducer utilizes temperature sensors to monitor changes in water temperature. It includes 20 feet of cable with an 8-pin connector and a metallic mount. Given its name, the HOOK2 TripleShot uses three types of sonar: DownScan, SideScan, and Wide-Angle High CHIRP. For the Wide-Angle CHIRP, the transducer operates using a conical beam that covers up to approximately 40° and a depth capability of up to 500 feet. This type of sonar offers a depth capability of 500 feet. Its CHIRP technology modulates the sonar pulse over a wide range of frequencies, so as to provide better target separation. For the DownScan and SideScan sonar, the transducer uses narrow, fan-shaped beams with unspecified angles. 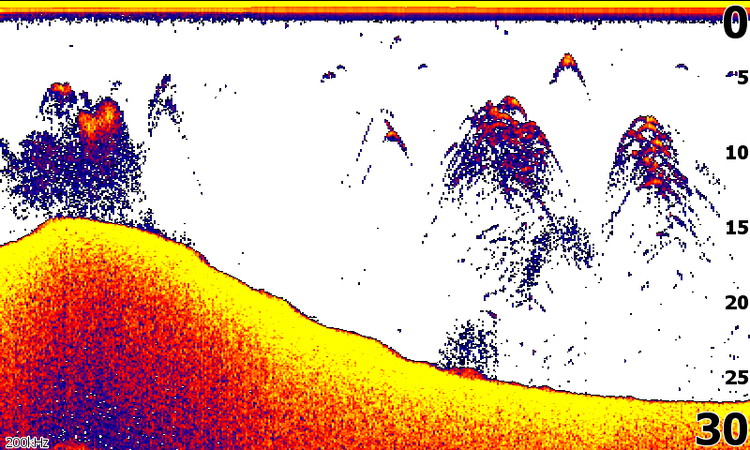 Since the two are structure-scanning sonar modes, the images of the bottom, vegetation, and structure appear to be much more defined. 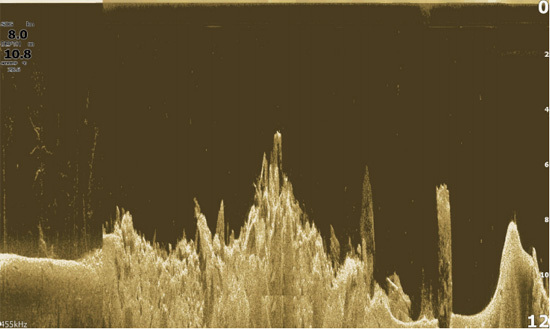 The depth capability of the two sonar modes can reach up to 300 feet at 455 kHz and 1,500 feet at 800 kHz. This Lowrance fish finder has exclusive automated sonar settings, which autotunes themselves, thus giving you more time to fish and less time to adjust the device’s settings. The unit itself is a plug-and-fish system, which automatically adjusts the sonar settings as changes in fishing conditions take place. The Lowrance HOOK2-7x TripleShot comes with standard sonar applications, such as the depth alarm, circular flasher, bottom range, fish ID, among several others. The Lowrance HOOK2-7x TripleShot, unfortunately, isn’t equipped with GPS mapping and chart compatibility. It only comes with a basic GPS plotter. Its GPS receiver is internal and can use WAAS (Wide Area Augmentation System), EGNOS (European Geostationary Navigation Overlay Service), and MTSAT (Multi-functional Satellite Augmentation System) satellites when available. As with any basic GPS plotter, the data is displayed on a blank sheet, showing your position with the longitude and latitude coordinates and updates your position five times every second. The GPS plotter lets you create routes and save waypoints, and automatically tracks and outlines the movement of your vessel on the blank sheet. The Man-Over-Board (MOB) function, on the other hand, offers a different way to produce a waypoint quickly. You can create and record a MOB waypoint using the vessel’s current location by simultaneously pressing both zoom keys of the device. This Garmin fish finder GPS combo features a small WQVGA-color display, with only a 480x2720pixel and 4.3-inch diagonal matrix. Despite its size, its LED backlight provides excellent readability in bright daylight or at night. As stated above, the IPX7-waterproof feature means the device can withstand incidental water exposure such as rain, splashes, or even quick immersions. This Garmin fishfinder GPS combo is NMEA 0183-enabled and comes with a microSD card reader for chart upgrades, data transfer, or sonar recording. The package doesn’t include a cover, but it comes with a classic, tilt-and-swivel mount. This unit comes with a GT20-TM transducer, which integrates a temperature sensor and includes both trolling and transom motor mounts, and a 20-feet cable with a 4-pin connector. Its control unit is capable of 260/455/800 kHz for ClearVü and 50/77/200 kHz for 2D sonar. The transducer enables the unit to use mid-and high-range CHIRP for its 2D sonar and modulates the sonar pulse between 435-475 kHz and 800-840 kHz. Given the benefit of CHIRP technology, the display images are significantly clearer with less clutter. 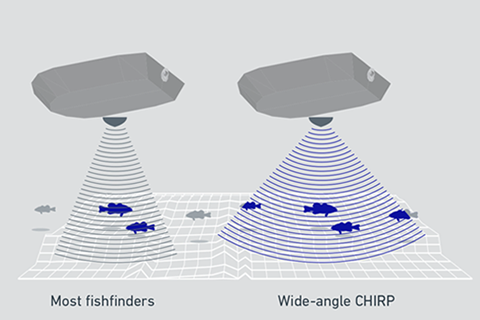 And as we’ve mentioned above, CHIRP provides better target separation, spotting the fish targets in a school and separately, even when they’re close together. The Garmin echoMAP CHIRP 44cv is built with an internal 5 Hz GPS/GLONASS antenna, which updates your position five times/second. It can also determine the speed of your boat through the information its GPS module gathers. The device can save up to 100 routes and 5,000 waypoints and is designed with a trail-recording function to save up to 50 tracks and 50,000 track points. With these features, you are able to add waypoints to your routes, convert tracks into routes, and retrace them conveniently. The device comes with preloaded BlueChart® g2 HD charts, which offer comprehensive coverage: the East Coast, West Coast, US and Canadian sides of the Great Lakes, and the Gulf of Mexico. 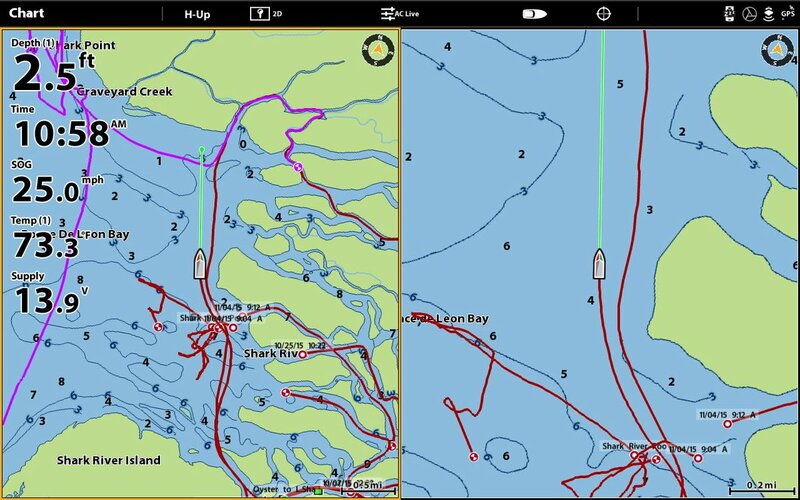 The BlueChart g2 HD charts also include tidal stations, IALA symbols, fishing charts with bathymetric contours and currents information, with less clutter on the display. The device is designed with Shallow Water Shading Function, which allows you to assign a safe depth and do away with all the other depths that are shallower than the one you selected. You can choose up to 10 color codes for the depth contours in your fishing spot, to be able to view the depth conducive to navigation or fishing at a glance. One of Lowrance’s newest fish finders for 2018, the HOOK2-5 SplitShot is actually the state-of-the-art variant of the HOOK-5. The device unit aims to provide users with an optimal array of revolutionary sonar and navigation features for inland fishing, while doing away with some of the less useful features for a 5-inch unit, such as the NMEA and 50 kHz capabilities. Its easiest-to-use menu operation and highly-optimized keypad make it a great entry-level fish finder combo device. The HOOK2-5 SplitShot comes with a 5-inch SolarMAX™ Display, giving you crisp views of underwater structures and fish targets and excellent daylight visibility. It is built with a user-friendly menu layout and highly optimized keypad that let you access the controls with a few key presses. At the heart of HOOK2 is its unparalleled autotuning sonar technology, which Lowrance prides itself on as a true game changer in the industry. It automatically adjusts the device’s sonar settings as conditions in the water change, giving you the best image quality. Designed by fishers for fishers, its user-friendly settings trims down your time spent on tinkering with the buttons, allowing you to spend more time fishing. One of the best fish finder GPS combos $500, the HOOK2-5 is engineered with the powerful SplitShot 2-in-1 sonar system, which features high CHIRP sonar with double the coverage you can find in many fish finders. 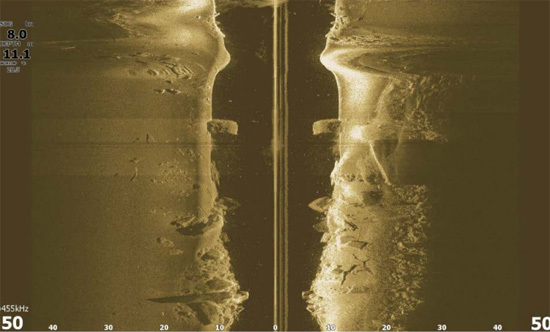 Its solid CHIRP sonar and DownScan Imaging™ tandem let you kick your angling up a notch. The Lowrance HOOK2-5 Splitshot is equipped with a high-detail, built-in US map with exceptionally precise contours of more than 3,000 lakes in the United States, allowing you to return to your favorite spot or even getting a new one in a breeze. The Lowrance HOOK2-5 also comes with a bundled Navionics charts for the whole United States and Canada, with a multitude of accurate-detail maps of North American rivers and lakes. Flaunting fluid performance, versatility, and a reasonable price tag, the Humminbird 410210-1 HELIX 5 CHIRP GPS G2 is hands down the best fish finder GPS combos under $500 in this list. It is packed with premium features such as Unimap charts, transducer, GPS, and CHIRP Sonar technology, to name a few, and can be used for both fresh and saltwater and small and big-size boats. While there are other devices in this list that are relatively cheaper, the Humminbird Helix 5 G2, with its best-in-class performance and features, gives even its strongest competitors a good run for their money.